The ways in which local councils manage relationships with the communities they serve are undergoing significant change, partly as the statutory frameworks for local governments themselves change, and partly in response to changing community expectations. This paper provides an overview of the evolution of community governance in Australia considering both local government practice and the unique role of the community banking network of the Bendigo Bank. It is contextualised by an examination of recent literature on governance, which supports a series of interviews/case studies. A wide range of innovative practice is identified, implications are drawn for local government structure and practice, and recommendations made both for strengthening community governance and for further developing the relationship between local government and community banking. 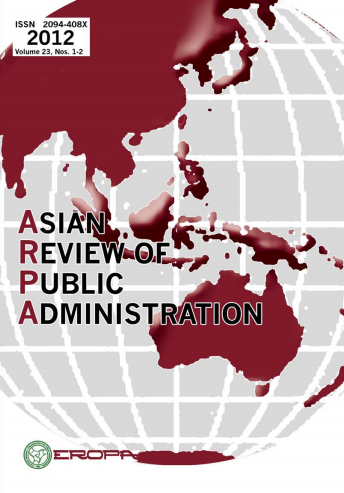 BPK (Badan Pemeriksa Keuangan) is the Indonesian Supreme Audit Institution (SAI), and its reporting practices are of great importance in helping determine the quality of government in what is one of the world’s largest effective democracies. This article reports briefly on the evolution of those practices, and analyses the results of a survey of auditors, MPs at central and local levels of government, and auditees (public sector employees subject to audit) aimed at assessing the views of all these groups about the effectiveness of BPK reporting today. Existing studies have argued that the Korean economic crisis was a core factor for explaining the emergence and evolution of the social concertation system when the Korea Tripartite Commission was established in 1998. The Korean economic crisis partially contributes to the advent of social concertation; however, it is inappropriate for explaining the evolution of social concertation in Korea. This study suggests that international organizations, including the ILO and the OECD, have played an important role in evolving Korean social concertation. Furthermore, we propose that the Korean government positively accept universal norms about relationships among labor, management, and government by international organizations for another leap in a stagnant Korean social concertation system. This article discusses the “citizen’s charter” as an instrument for the development of a democratic public service. Theoretically, linking public service to democracy is a challenging task in public administration. Traditional models of public administration consider the government as responsible for ensuring public service efficiency and effectiveness. On the contrary, the citizen’s charter model espouses the notion of involving citizens in determining public service delivery methods. This article will discuss the adoption of the citizen’s charter in the service of birth certificate delivery in Yogyakarta city, Indonesia. There was a need to improve the delivery of birth certificate services due to the fact that the process one had to follow to get them was plagued with red tape and uncertainty with respect to procedures, time required, and charges, as it involved several agencies. In fact, possessing a birth certificate influences right of access to delivery of other public services such as education and health services. The participation of citizens has not only contributed significantly toward improving public service quality generally, but has also enhanced political consciousness of the citizen’s right to influence government processes. Consequently, local officials such as the village heads and the sub-district heads have become more accountable in providing public services.